Another world record has been broken in Dubai, as cyclists gave a whole other meaning to putting the pedal to the metal. Dubai: Another world record has been broken in Dubai, as cyclists gave a whole other meaning to putting the pedal to the metal. 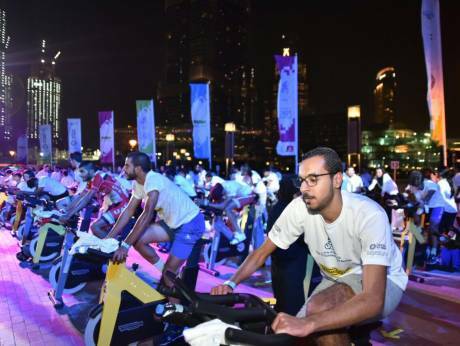 On November 26, 2016, an impressive 8,999 watts was produced when 300 residents cycled for one hour on 100 stationary bicycles – breaking the world record for the most mechanical energy produced in one hour. The event took place at the Innovation Hub in Burj Park Downtown Dubai on Shaikh Mohammad Bin Rashid Boulevard. The previous record for the most mechanical energy produced in one hour by pedaling on static bicycles was 8,369.8 watts in an hour, at Stoke Park, in the United Kingdom last June.